How often do you use the Black Market Auction House, and which of its items continues to elude you? This little feature — the Black Market Auction House — has been in the game since Mists of Pandaria. The premise is items which are no longer in the game or are gated behind long reputation lines or are just a pain to get, will periodically show up in the BMAH. This feature was also designed to remove gold from the economy with items set at a specific level for an initial bid. The hardest part (for me) is finding the BMAH each expansion. 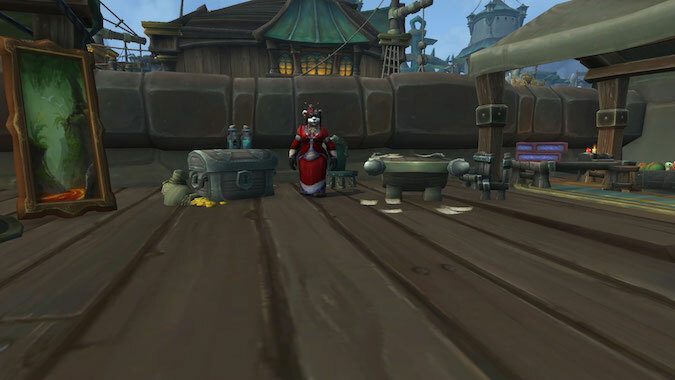 Over the years, Madame Goya has set up shop east of the Tavern in the Mists in the Veiled Stair zone of Pandaria; adjacent to the Ring of Blood in the Nagrand zone of Draenor; and in the underbelly of Dalaran, which was a PVP zone. In Battle for Azeroth, Madame Goya herself is located in the Tortollan Refuge. She maintains a separate location in Boralus — run by Madame Gosu — in Hook Point. Be advised. Madame Goya’s bodyguards are nowhere to be found in Boralus. When going to see Madame Gosu, there are hostile mobs near and in her area. When this initially came out, I wasn’t clear on the concept. I’d pop over to the BMAH just to see what was available for sale, but nothing I saw tempted me to plunk down any hard-earned gold in an attempt to get it. That changed when I was working on Crazy Cat Lady and needed to get two more cats for the achievement. I desperately wanted the Black Tabby cat, as I am owned by a long-haired black cat. It’s a Horde-only drop and I had my Horde toon farming it daily. It never dropped. Low and behold, it shows up on the BMAH. I wasn’t sure what the duration meant — and it’s still confusing to me — but I stayed online all day to watch that auction. Occasionally, someone would up the price but I won the auction and got one more step closer to the title. After that, there was no turning back. Recently, there were tailoring patterns and Classic shaman gear — which is mail, meaning my Hunter can wear it. I’ve been successful on the patterns, but not on the gear. I’ve seen Invincible’s Reins and the Reins of the Plagued Proto-drake. The last one you can’t get anymore and many of us are convinced — after years of running Icecrown Citadel — Invincible doesn’t exist either. My questions to you are, do you use the BMAH, and, if so, is it part of your log-in routine to run over and see what’s for sale? Which BMAH location was the easiest to get to, in your opinion? I have not gone to the Tortollan Refuge, but I think the initial location was the easiest. What do you think of this concept? Is there something you haven’t seen in the BMAH that you’d like to see? And finally, what was your biggest score? Were you the player who spent 950,000 gold to get Invincible or did you just show up to see how high it would go?